A good portion of this blog is dedicated to classical music [especially every weekend on The Tales]. 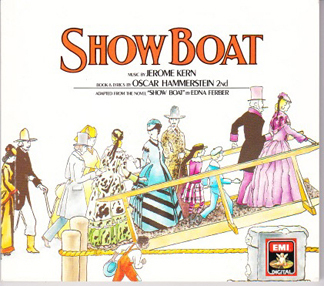 Well "Show Boat" may not contain classical music but it is definitely one of the great classic musicals. Two legends of song writing collaborated in giving some great songs in this musical: Jerome Kern with the music and Oscar Hammerstein II with the lyrics. A couple of years ago in Houston the fetching Mrs. B and I saw the musical Show Boat, and it was quite a 'show' indeed! One of the great show tunes ever written, "Old Man River" came out of this epic performing art. Please turn up the volume and enjoy this awesome performance as bass-baritone and bass singer, Samuel Ramey, sings "Ol' Man River" .